One of my favorite New Yorker cartoons is of two guys chatting at a cocktail party. One guys says; "I'm writing a book". The other guys says "Me neither!" Personally, I love to write. I often joke that I'm a writer trapped in a Realtor's body. Unfortunately, being a full time Realtor in Ballard Seatle tends to get in the way of, well....writing, or more specifically, blogging about real estate. Blogging is a great way to promote yourself, your business and your own personal brand, no matter what line of business you are in, However, blogging is a beautiful fit for real estate agents. There's an endless number of topics that you can write about to make you stand out from the herd, share your knowledge and educated your buyers and sellers. And yes, get leads too. 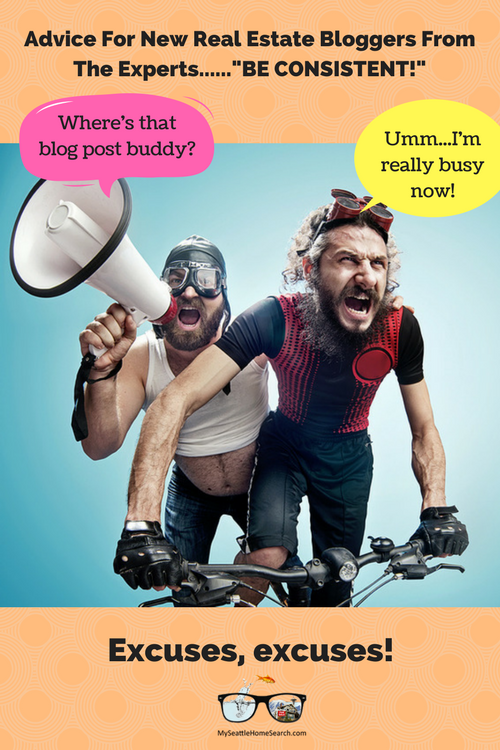 Many Realtors are intimidated by the mere thought of starting blogging the first place. Plus many who actually do put finger tips to keyboard quickly give up. They were expecting miracle results and for their phone to start ringing off the hook after that fabulous 200 word post they wrote about their new listing. I've been blogging consistently inconsistently, or is that inconsistently consistent for the past 2 years. And yes, I have struggled at times to find the time to blog and know I need to improve at certain aspects like promoting my posts. I'm at about a 6.2 out of 10 (10 being a Bill Gassett) of where I really want to be but I'm improving slowly but surely. There's always something new to learn.